Most people will say the opposite, that your dental care starts at home. However, it simply continues at home. If you aren’t seeing a dental professional that has all the right equipment, you’re still putting your mouth at risk for cavities, gum disease, and more. Yes, you should still brush your teeth at least twice a day, floss daily and use mouthwash to loosen stuff trapped in your teeth and freshen your breath. But, if you aren’t getting your yearly dental checkup and professional cleaning you might just be going through the motions. Here are some of the reasons your dentist is important to the health or your mouth. The teeth cleaning you get done at the dentist gets far more gunk off your teeth than you could ever manage at home. They have tools that can scrape all of the plaque off your teeth, getting your teeth as clean as possible. They also know how to properly use these tools, so while you can buy them online it’s not really a wise thing to do (you could severely damage your teeth or hurt your mouth in other ways). Your dentist will also do x-rays of your teeth, which can help with discovering everything from cavities to cracks in your teeth. It also gets down to the root of the problem, so your dentist can see if there are any issue below the surface of the parts of teeth you can see. There can be cracks and more in your roots. 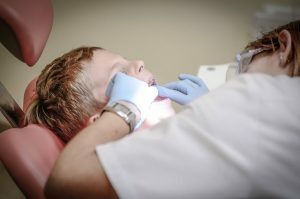 If you have dental pain or an abscessed tooth, x-rays will point out the issue and show them where they need to do work. Some of that work may include fillings. When it comes to needing teeth pulled, instead of getting them filled, you may also want bridges put in to help keep the integrity of your mouth and avoid shifting tooth or future jaw issues. Your dentist is also going to be the first person you talk to about false teeth or getting implants. They will be the one that sends you to an oral surgeon when you have wisdom teeth issues. And they will also be the one to suggest orthodontic care if your teeth are crooked. Your dentist is your first defense against gum disease. They will notice the signs of it long before you will, and before your gums begin receding and getting painful. Take their dental care suggestions and you can be sure to keep your dental health (and your real teeth) for far longer. But, if you don’t go in every year, and when you have dental emergencies, they can’t help you.